Stryker Heartsine AED 500p | Rescue 7 Inc.
Stryker HeartSine has taken an innovative approach to maintenance items by incorporating the AED batteries and electrodes into one single-use cartridge called the Pad-Pak. 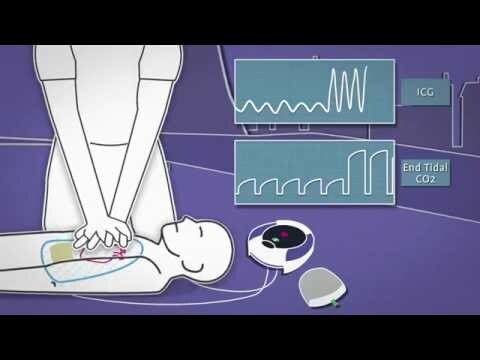 Stryker HeartSine AED 500P defibrillator with CPR Advisor is the most innovative device available to support these guidelines, giving rescuers feedback on the effectiveness of their CPR efforts – in real time. The Stryker HeartSine AED 500P defibrillator provides the rescuer with real-time instructions regarding compressions with audible “Good Compressions” or “Push Harder,” “Push Faster” and “Push Slower.” This is also displayed on the face of the device in order to ensure the rescuer performs the most effective CPR. An Impedance Cardiogram (ICG) is embedded in the software, which guides the user in the required force and speed of compressions for the victim. The ICG measures changes in the chest cavity, which determines effective CPR. Because the blood flow is related to how fast the compressions are applied, as well as how hard, the Stryker HeartSine AED 500P can guide the user on both force and depth.